- Publisher The First Epistle of Peter constitutes an important work of New Testament theology and pastoral care, serves as an example of how the early church applied Jesus' sayings and the old Testament writings to contemporary concerns, and presents some extremely useful perspectives on living the Christian life today. This commentary by Peter Davids does an excellent job of mining the rich wealth of instruction to be found in this very significant section of Scripture. 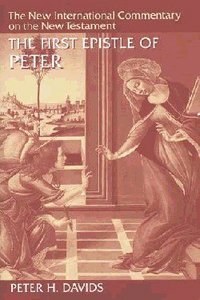 About "The First Epistle of Peter (New International Commentary On The New Testament Series)"
Peter H. Davids (PhD, University of Manchester) is Professor of Biblical Theology, St. Stephens University, New Brunswick, Canada. He is the author of commentaries on James (NIBC, NIGTC) and 1 Peter (NICNT) and co-editor of the Dictionary of the Later New Testament and Its Developments. In this commentary Gordon Fee aims first and foremost to offer a fresh exposition of the text of 1 and 2 Thessalonians. He shows the reader what is in the biblical text, what the text meant in the first century, and what it means now. Fee reveals the logic of each argument or narrative before moving on to the details of each verse, and he concludes each section with a theological-practical reflection on the meaning of the text today. Among other things, Fee explores the occasion for writing for each epistle, restoring 2 Thessalonians to the place it deserves as a full companion to the first letter, rather than merely a tagalong to 1 Thessalonians. This elegantly written, section-by-section, verse-by-verse commentary gives primary attention to the Gospel of John in its present form rather than to the sources or traditions behind it. Since J. Ramsey Michaels takes seriously the Gospel's claim to be the work of someone very close to Jesus - the "disciple whom Jesus loved" - he assumes it to be a testimony to events that actually took place in the life of Jesus. At the same time, his commentary places as much (or more) emphasis on the Gospel's literary character and its theological contribution to a larger Christian community, both in its own time and up to the present. Michaels shows John to be a unified composition, intertwined with but not dependent on the other three Gospels, drawing sometimes on their traditions and at other times on earlier traditions unknown to Matthew, Mark, and Luke. Seventeen years in the making, synchronic in approach, reflecting fifty years of classroom teaching, packed with fresh insights, and displaying a great deal of independent judgment, this landmark commentary should prove to be highly useful not only to scholars and students but also to its main target audience of pastors. "Here is a substantial, truly original exposition of extraordinary insight and helpfulness to pastor and scholar alike, which should have a considerable life span after both the author and editor have gone to their eternal reward." Prepared by some of the world's leading evangelical scholars, the NEW INTERNATIONAL COMMENTARY ON THE NEW TESTAMENT series provides an exposition of the New Testament books that is thorough and fully abreast of modern scholarship yet faithful to the Scriptures as the infallible Word of God. Gordon Fee's volume on Paul's letter to the suffering Christians in Philippi is written primarily for pastors and students. Fee's verse-by-verse commentary is uncluttered by technical discussions and offers suggestions for practical application throughout. 543 pages, from Eerdmans.